As a designer your day is full of running around either on job sites or scouting items for clients but for the last few months I have committed myself to spending one FULL day in the office. Let me just tell you it is heavenly. Not only am I checking items off my list but I am able to take a minute to open interesting promotional emails that come across my screen....instead of you know letting them build up with the hopes that I get back to it someday. Well today I am so happy to have been at my desk as the delightful guys at PATCH NYC just sent out their email blast where I was introduced to a wonderful new artist! 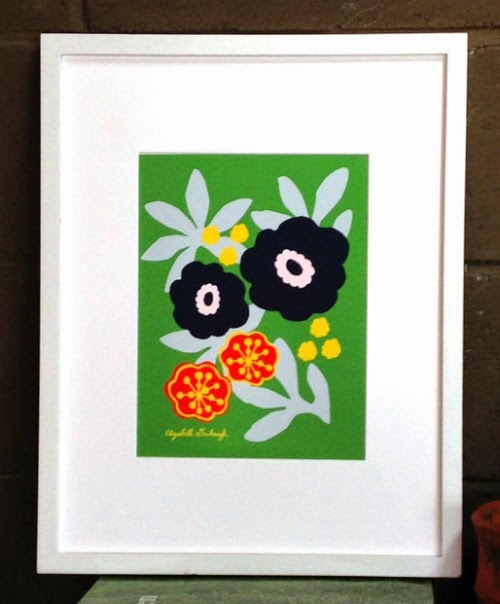 Elizabth Grubaugh's prints are prominently featured in Patch's store for their Open Studio series. 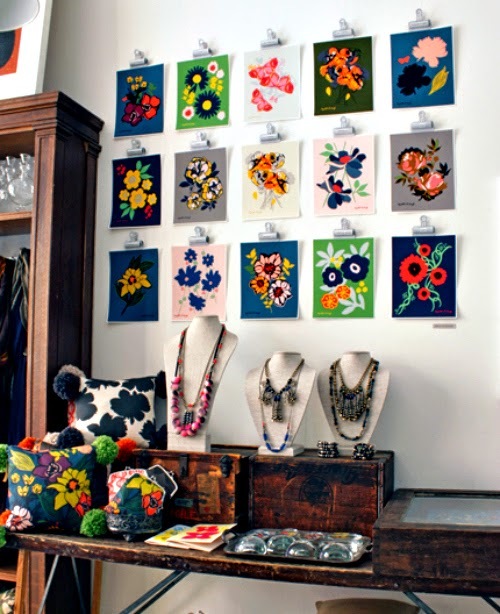 I immediately fell in love with her use of bold colors and abstract florals. A bonus is that they are super affordable at $30 each unframed. This is how Elizabeth describes her process "All my prints start as paintings first. I usually use Japanese sumi ink on water color paper. Then everything gets scanned, and I have fun trying lots of different color combinations." "Field of Daisies" is by far my favorite. The subtle hint of soft pink takes the boldness of the print down a notch and in doing so adds a delicate feel. 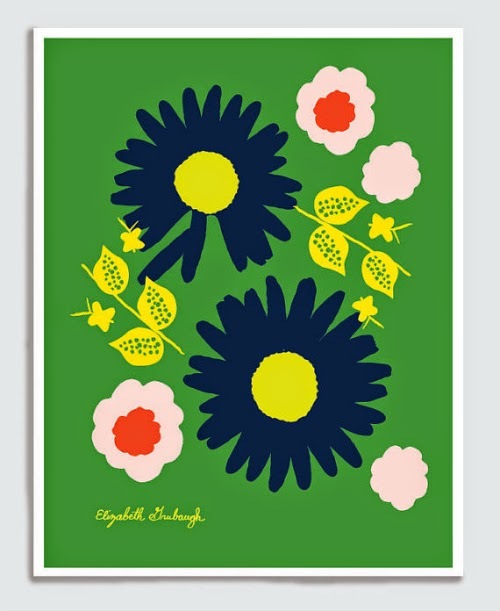 This is the print that first caught my attention, I love the "Sunshine Flowers" it exudes such happiness and I think it would be perfect in a little girls bedroom. A bit mature but also very fun, a print she could grow up with! 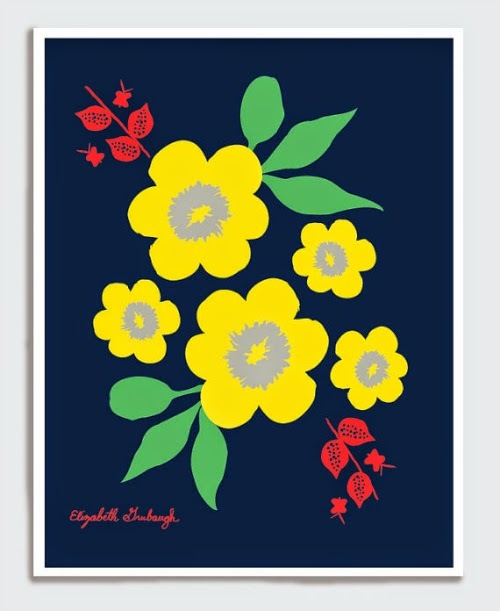 If you are in Boston pop on over to PATCH NYC in the South End to view many more pieces of Elizabeth's artwork. Not local? No worries you can visit her online at Dewey Howard or on Patch NYC website. Now I am off to order a Sunshine Flower for my own office, after all who could not use a little happiness while going through emails?